Poet, visual artist, educator, and community worker, Imani Tolliver is a graduate of Howard University where she studied English Literature and African-American Studies. During her studies, she was awarded a Lannon Literary Fellowship at the Folger Shakespeare Library, the John J. Wright Literary Award and is a fellow at Cave Canem African-American Writer's Workshop and Retreat. She has served as a consultant to community organizations, museums, educators, and The Office of the President. Presently, she works for a non-profit organization, serving high-risk and homeless youth in Hollywood, California. She has been a featured poet across the country, including the Nuyorican Poet's Café, the Smithsonian Institution, Beyond Baroque, the World Stage Performance Gallery, and the Autry Museum of Western Heritage. 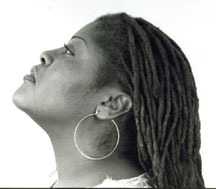 Find her published poetry in several anthologies and journals, including Cave Canem II, IV, and V, Jones Juke Joint Magic, The Flow: New Black Poetry in Motion, Ghettoes are not Beautiful, Black Love, The Drumming Between Us - A Poetry Journal, Drum Voices Review, Step Into A World - A Global Anthology of the New Black Literature, Bum Rush the Page: A Def Poetry Jam, Beyond the Frontier, Beyond the Valley of the Contemporary Poets, and the forthcoming, Poetry is not a Luxury: LA Women of Color.